For many people, Scotland is above all the home of golf. And if you ask golfers for a list of their top half-dozen courses in Scotland, then it's likely that Carnoustie will feature on most. Carnoustie is found on the coast, ten miles east of Dundee. The Championship Course at Carnoustie features every ten years or so on the rota of Open Championship venues, and also hosts a number of other major championships. Carnoustie is bypassed a couple of miles inland by the A92, which means that you only need to visit if you want to. The slight detour is well worth the effort, though when a major golf tournament is under way you might wish to consider deferring a visit planned for any other reason. The origins of Carnoustie date back at least as far as the early 1500s, when the name was recorded as "Carnowis". By 1575, mention was being made of "Carnussie Farm". Other variants on the name followed over the following century or two. There are a number of theories about the origin of the name, but none seem particularly convincing. The first mention of a village called Carnoustie comes in the middle of the 1700s, when it seems that linen weaving was an important local industry. The village grew as demand for linen increased during the last few decades of the 1700s, while agriculture and fishing remained important to the local economy. The Dundee & Arbroath Railway opened a station in Carnoustie in 1838 and this encouraged further growth, with a vitriol works opening to the west of the town to produce sulphuric acid for use in the production of agricultural fertiliser. The textile industry also continued to expand. The Panmure Works, which opened in 1857, provided 600 jobs at its height and produced six million yards of linen and jute each year. Parts of the works continue in operation today. Another early success, and one that also continues, was Carnoustie's role as a centre for malting barley. Today it supplies customers as far afield as the Glenturret Distillery in Crieff. And by 1874 a shoemaker was employing 200 people in Carnoustie. 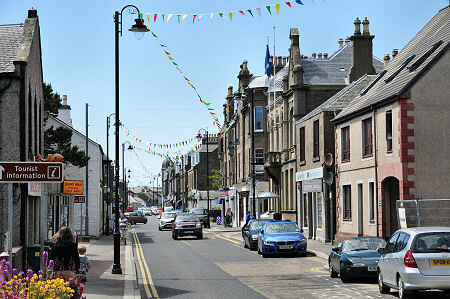 The railway also meant that Carnoustie became an early dormitory town for Dundee, while at the same time developing as a seaside resort for those looking to escape from the city. The Carnoustie Golf Club was founded here in 1842, and with it came the first 18 hole golf course in Carnoustie. This was followed by the Carnoustie Lady's Golf Club in 1873. Ten years later, Simpsons Golf Shop appeared in the town, the precursor of an industry now said to be one of most lucrative in the world. The shop is still here, complete with its wonderfully attractive "golf umbrella" dome; and as you would expect, Carnoustie also offers a number of other golfing shops. Carnoustie today boasts no fewer than three golf courses, with a number of others within a fairly short drive of the town. The latest and most spectacular addition to the golfing scene is the large Carnoustie Golf Hotel, a four star hotel complex completed in time for the 1999 Open Championship. This was the first since 1975 to be held in Carnoustie, and the first since 1985 to be won by a Scotsman: Paul Lawrie. 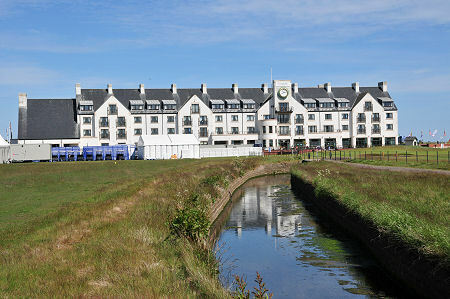 The 2007 Open Championship also took place here, and the championship will next return to Carnoustie in 2018. Carnoustie's golf courses lie at the east end of the large triangle of Barry Links, which projects into the north side of the mouth of the Firth of Tay. Beyond the golf courses is Scotland's largest military training area, Barry Buddon Ranges, which have been in use since 1895. Their presence explains the sound of gunfire which can often be heard in the town and, especially, on the golf courses. Carnoustie today boasts a railway station in the town, as well as another used for spectators coming to major golfing events. 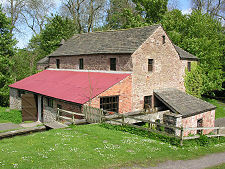 Two miles west of Carnoustie is Barry Mill, a rare example of a surviving water powered oatmeal mill, which is in the care of the National Trust for Scotland. It is powered by the water of the Barry Burn, better known for forming an obstacle on the golf links. It can be reached from the A930 west of Carnoustie, or from the A92, and is well worth a visit.